Today we are having a snow day in middle Tennessee which means everything is closed and my whole family is home! Luckily I made it out to the post office this morning to ship some quilts before the rain turned to snow. Earlier in the week I mentioned that I had gotten my UFO's organized. Hopefully this will keep me motivated to work on my unfinished projects. Let me show you what I did and maybe it will help you too. A few years ago I found these awesome printables made by Taryn of "from Pixels to Patchwork" and pinned them to one of my Pinterest boards. If you are anything like me you pin lots of fun ideas and never get to any of them! Taryn has made these organizational sheets available in both PDF and word formats, and they are FREE! Thank you Taryn! As I was trying to figure out how to get organized I vaguely remembered pinning these sheets and was able to track them down amidst my 4,000+ pins (like I will ever have time for that!) Thankfully Taryn still has the available on her blog and yes they are still free. I downloaded the Word version and was able to add my projects to the list and it looks nice and neat. Taryn also has individual project sheets so you can add more details about your project and break down the steps needed to get the project done. The file was so easy to use and you can even import a picture of your project. I wish I ha a color printer because these project sheets look so cute in color. Finally I put my lists and project sheets into this cute binder I found at Walmart today. It has a gold foil peacock feather on the spine and it is in aqua ombre. 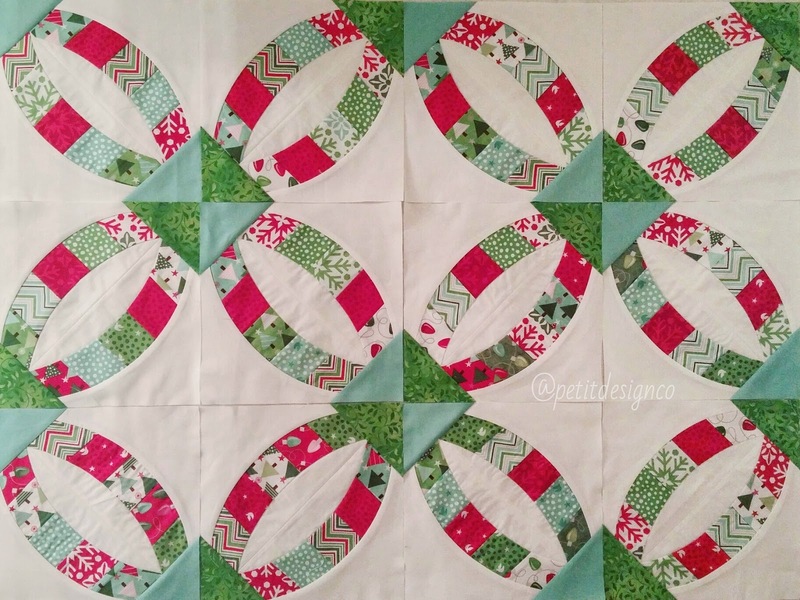 Perfect for cute quilt projects! 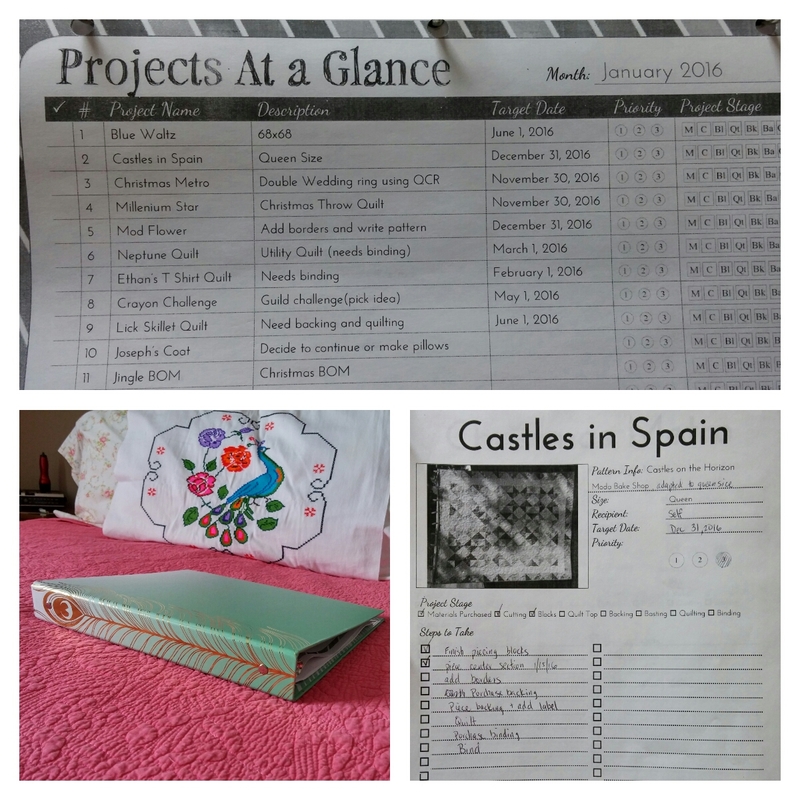 I would love to know how you keep your projects organized. At our first guild meeting of the year UFO #3 was drawn. If you have no idea what I'm talking about go read this post. Would you like to play along? Simply make your own UFO list (#1-11) and I'll update you on the 2nd Thursday of every month an let you know which number was drawn at my guild. You then have a whole month to work on that UFO. Share your progress with me and I'll help encourage you along the way. This is a project that became a UFO because the instructions on squaring up can be a bit confusing. I messed up a few blocks during the squaring up process and had to order more fabric because I am making a queen size version of this quilt. 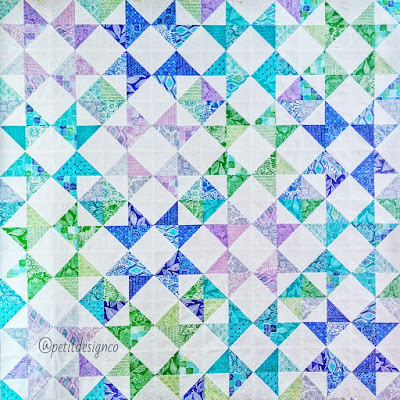 If you are making the quilt in the size given on the pattern, then you should have enough strips left over to be able to mess up on a few! This time I around I decided to take each step slowly and make one whole block before making the rest in assembly line fashion. I still managed to mess up a few blocks during the squaring up of the individual arcs, but not enough to where I feel I need to remake them. Well, except for 1 which is just awful! (The one in the top right corner.) Luckily I found this tutorial on Jenny's website so I could zoom in on the pictures and see the steps more clearly. I think I know what I'm doing now and look forward to making the rest of the blocks for this quilt. I guess I should figure out how many blocks I need in total. In case you are wondering I found the piecing of the curved arcs easy enough and didn't use pins. It's the squaring up where I had troubles. It feels good to cross one off my UFO list. I'm so excited for 2016. I feel refreshed after a long break from blogging. I feel like I took a break from sewing/quilting as well.While I did a lot of longarm quilting, it seems like 90% of my sewing and quilting from last year was all for clients. 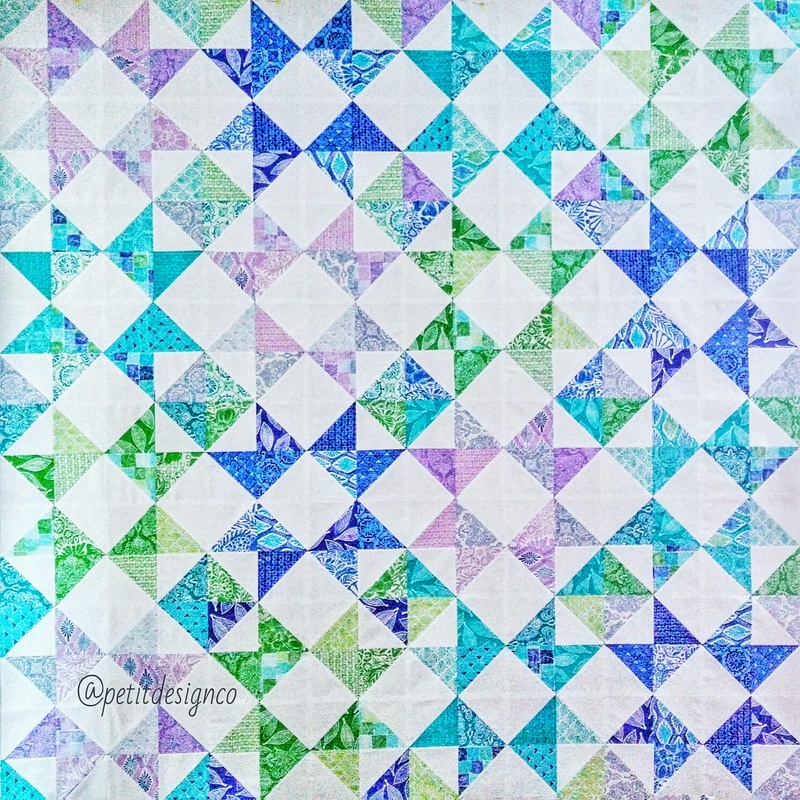 (I updated my longarm site so you can see all the pretty quilts I worked on.) I made a few small projects here and there but I didn't really get to finish any big projects for myself. Life in general was also busy with school (both mine and the kids), family stuff, an church stuff. So far this year, yes all 20 days of it, I feel like I have accomplished quite a bit. First I got organized by making a list and project sheet for most of my UFO's. I say "most" because after I was done organizing I started remembering and finding other UFO's! I'll share my organizing methods with you later in the week. I also completed a few steps on some UFO's so that feels super rewarding. 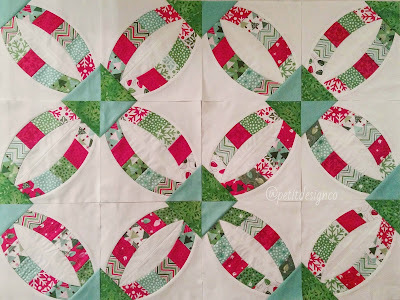 My quilt guild is helping me stay on track with my UFO's by doing a fun challenge. Before our January meeting we were to make a list of 11 UFO's we wanted to work on in 2016. After compiling our list we were to number our projects 1-11. At each monthly meeting a random number will be drawn and that is the UFO that you work on for the month, until our next monthly meeting. How fun is that?! There are prizes involved too! I basically have 5 projects I decided to work on. Rather than list 11 different projects and feel overwhelmed, I choose 5 large projects and broke them up into manageable sections.